Don’t you just feel that a weekend is just too short? Even when you’re a stay-at-home-mom and don’t really get weekends off, the weekends are still precious. They just have a whole other vibe – plus, you get to spend it together as a family – whether you work in the garden, watch TV, visit friends, hit the malls, whatever. So yes, I always feel a weekend is too short and that Mondays are for getting back into your week-routine. Mondays need comfort food – doesn’t matter whether it’s Summer, Winter or whether you’re in Joburg or Texas… Mondays are ‘recovery’ days! The easiest is to start by making your cauli-mash. Blitz the cooked cauliflower with a stick blender until smooth. Season with salt & white pepper and add the butter. Next, heat a good glug of olive oil in a large pot and saute the onions. Add the aubergine, garlic, chili and Peppadew spice. Let this saute until you’re about halfway cooked and slightly browned. Add the tomatoes and the can of tomatoes and water. 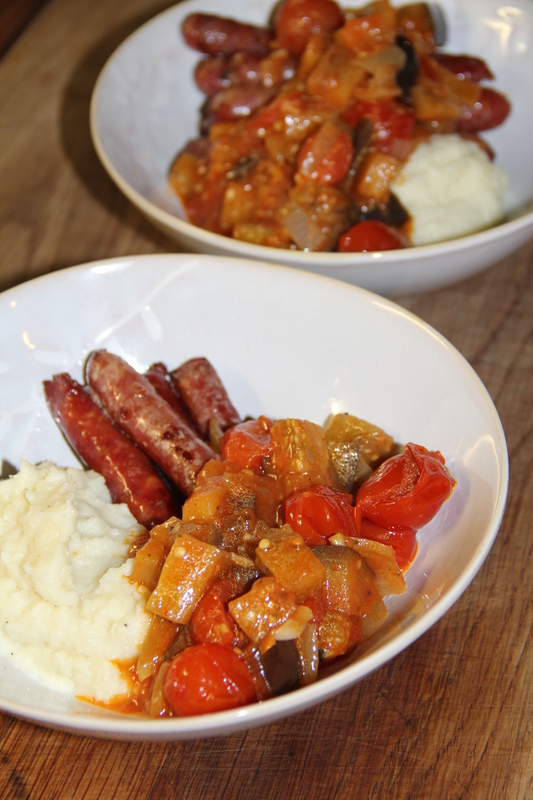 Serve the mash with your smokey sausages and a generous helping of the tomato salsa.